The Ancient City of Tauric Chersonese and its Chora covers an archaeological site and agricultural landscape of Greek origin. It is located on a peninsula in Crimea, at the shores of the northern Black Sea. It was colonized by the Greeks in the 5th century BC and used as a trading port. Wine, produced locally, was one of the main export products. After the Greeks were defeated, the city fell into the realm of Rome and later Byzantium. It was abandoned in the 15th century. The designated zone consists of 7 locations: the ancient city with its original grid layout and 6 surrounding areas with plots of agricultural land. I visited Crimea in September 2018, when I flew from Murmansk to Simferopol, the de facto capital of Crimea, and caught a bus at the airport to Sevastopol, the largest city on the Crimean Peninsula and a major Black Sea port. Like many cities in the former Soviet Union, Sevastopol is stocked with war memorials, monuments and statues, yet empty of international tourists deterred by its political status and sanctions imposed by Western governments in response to the annexation of Crimea by Russia. I had to bring a stack of Russian rubles because my ATM and credit cards were useless. I stayed at the Sevastopol Hotel, opened in 1959 and the city's oldest hotel. I took a local bus from the bus stop nearby the hotel to Chersonesus, an ancient Greek colony founded 2,500 years ago on the Black Sea, now located in the outskirts of Sevastopol. 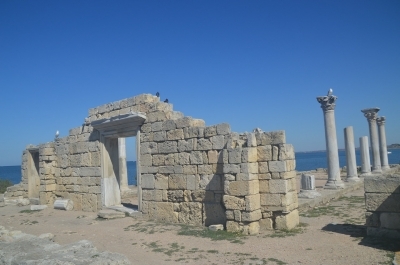 The site, nicknamed the Ukrainian Pompeii, was successively controlled by the Greek, Roman and Byzantine Empires, and is the only World Heritage Site on the Crimean Peninsula. I took a bus from Sevastopol to Yalta, on the southern coast of Crimea. There are frequent boats to the Swallow's Nest, designed to look like a medieval knight's castle, but really an architectural folly built primarily for decorative purposes. The small castle supposedly earned its name because it sits like a swallow’s nest on steep cliffs overlooking the Black Sea. I also took a local bus to Livadia Palace just outside Yalta, which hosted the Yalta Conference in 1945 among President Franklin D. Roosevelt, Prime Minister Winston Churchill and Premier Joseph Stalin to shape a post-war peace and to discuss the re-establishment of the nations of war-torn Europe following WWII. I stayed at the Bristol Hotel, the oldest hotel in Yalta. 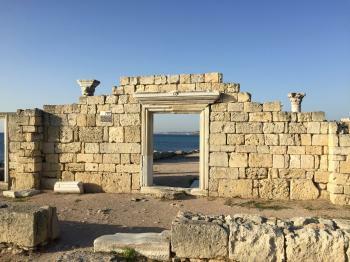 Just outside of Sevastopol, Crimea, the ruins of the nearly 2500-year-old town of Chersonesos remind us of the wide-reaching influence of the ancient Greek civilization. Founded in the 5th century BCE, it has traded hands from the Greeks to the Romans to the Byzantine Empire. The influences of each civilization can be found in the architecture that is remaining to be visible for the present-day visitors. The site's highlight is the so-called 1935 Basilica (named after the year it was discovered), which, with its collapsed columns and doorways provide a picturesque landscape. The city played an important part in the struggle between medieval Slavic kingdom of Kievan Rus and Byzantine Empire. Being the strongest northern outpost of Byzantium, it was subjected to numerous seiges by the Slavs. In 988, the town was captured by Kievan Prince Vladimir, who negotiated a peace treaty with the Byzantine Emperor Basil II, which included marrying Basil's daughter. Such an arrangement with a pagan caused an outrage in Constantinople, and Vladimir was forced to convert to Christianity. According to the legend, Vladimir was baptized in Chersonesos, an event which paved for the Christianization of the entire Kievan Rus. The site can be easily visited by a Sevastopol bus or marshrutka. The entrance to the site is free, however the entry to the exhibitions and guided tours cost 100 and 400 rubles respectively. Site visited June 2013. I visited this site when Crimea was still under Ukrainian rule. It has been inscribed just a few days earlier. Chersonese or Chersonesus is an ancient Greek colony located in the southwestern Crimea near the port city of Sevastopol. The World Heritage Site includes the complete ancient polis and seven fragments of its chora. 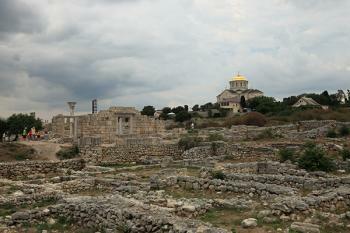 The main archaeological area is quite large (30 hectares) and it is located on the shore of the Black Sea. Excavations include structures from Hellenistic, Roman and Byzantine era. 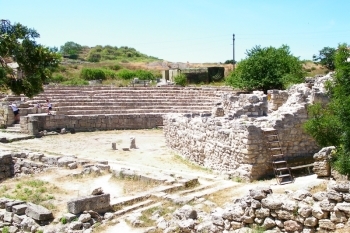 Chersonese is a popular day trip destination from Sevastopol. It is easy to reach by taxi which takes 20 minutes from the center. On the cliffs just beside the area there were lots of people swimming and sunbathing. Therefore a big part of the crowds at the site are not that interested in antiquity itself. On the main gate there is a small entrance fee. Directly after the entrance on the left side is a small Greek theater behind of which there is a large cistern. On the southeastern corner of the area near the entrance there are remains of huge defensive walls which are quite impressive. On the place of the ancient central square there is nowadays Saint Vladimir Cathedral which was originally built in the mid 19th century and destroyed during the World War II. The cathedral was reconstructed in the 1990s. Saint Vladimir Cathedral with its golden dome is the centrepiece of the site and it could be seen everywhere in the area. Going downhill after the cathedral there is a main street along which the best archaeological structures are located. Maybe the most famous single excavated building is the so called ’1935 Basilica’ which is beautiful with the Black Sea on the background. It has one standing wall with two door openings and several marble columns. On the site there are also numerous other churches, basilicas and residential blocks. Within the archaeological area is also so called Bell of Chersonese which is a Russian Navy memorabilia and also one of the symbols of Sevastopol. The bell seemed to be the favourite of the local tourists. This WHS includes also seven small sites outside the main archaeological area. These are the fragments of chora which are basically remains of the land plots of the citizens of Chersonese. I didn’t visit those sites but looking closer the places on the map, there isn’t a lot to see. Maybe those are of significance only to the committed archaeologists. I spent three hours at the site. There is really quite a lot of things to see. It was a pleasure to explore the vast archaeological area while enjoying the warm summer winds of the Black Sea. I found the cathedral and the excavations with numerous columns very photogenic. Watching the crowds of relaxed people strolling amid the ancient monuments there was same kind of a holiday feeling than in the similar archaeological sites in Greece. Having visited several Greek and Roman archaeological sites, I found this site well worth of inscription. What makes it unique is its location in the Crimean peninsula and the testimony of the exchange of influences between different regions and cultures. It is interesting what the future of this site will be in the current political situation. Visited in October 2014. This WHS is located on the Crimean peninsula. Today due to geopolitics the easiest way to visit is through Moscow and via some of the connecting flights, should you find yourself in Russia and don't want to bother with multiple-entry visa. Flights from Moscow land either in Simferopol or Sevastopol, the WHS itself is located on the outskirts of Sevastopol. We chose a taxi from our hotel in Sevastopol to get there and returned by walking and then taking a bus. As for other technicalities, you need Russian visa to enter Crimea and the accepted currency everywhere around is Russian Ruble. The site itself is spacious - the ancient city was located on a small peninsula between two bays. You enter it through the main gate, pay small entrance fee (120 rubles per person) and you can walk freely around the extensive site. The parts of it are not signposted, and if any sign or information is present, it's in Russian. There's an English and German speaking guide available, I would recommend booking a tour beforehand. It's hot there in summer but can be quite cold and windy in October, so dress accordingly. I know some travellers are a bit wary about visiting the Crimean Peninsula, so let me assure you it's safe. Not under control of the nominating state: Site nominated by Ukraine (2013), but the area has been under Russian control since 2014 after annexation of the Crimea. Part of Cultural nomination rejected: inscribed "with the exception of serial component no. 7 Cape Vinogradny"